This terrifically romantic hotel can be found be found just outside the village of Menstrie near Stirling. Excellent views of the castle and Wallace Monument. 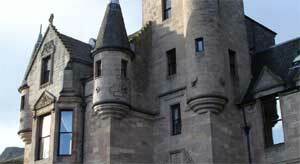 This handsome baronial castle dates back to the late 1800s and was based on the designs of Balmoral in the east. Over the years it has served as both a prep school and a riding school. The hotel enjoys some stunning views of the nearby Ochil Hills and is well located for exploring the magical Trossachs National Park and the famous Stirling Castle. Its proximity to the A9 also makes it handy for visiting Perth. Set on the deeply romantic slopes of Ochil Hill, the hotel features rooms that are steeped in history, some with four-poster beds. The Castle offers charming en suite rooms with solid wooden beds, a TV and tea/coffee facilities. The Broomhall restaurant offers a fine menu of fresh, local produce. There is a cosy lounge area.